WTG climbing access, rescue and evacuation for onshore and offshore turbines. 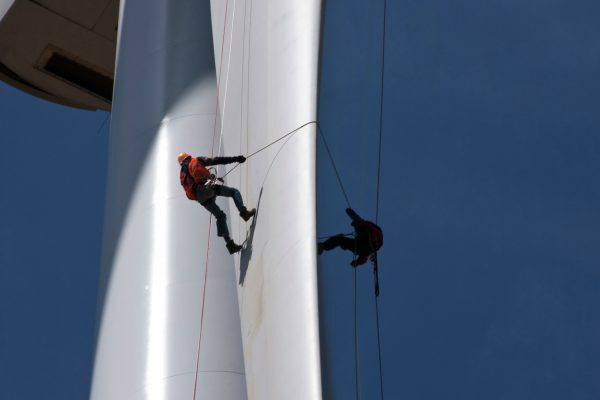 The renewable wind industry has seen a massive growth in turbine construction and demand for skilled technicians. The Global Wind Organisation accredited training course has become a standard requirement for anyone wishing to work within the UK wind industry. Accredited courses are available at all of our Height Safety Centres. At our main site in Kendal we have a WTG training simulator with tower, hub, yaw and roof which allows training to take place in a safe, but realistic environment. A cost-effective solution preventing downtime for operators. heightec has developed dedicated wind turbine work access equipment and rescue systems to meet the demands of wind turbine work both onshore and offshore.